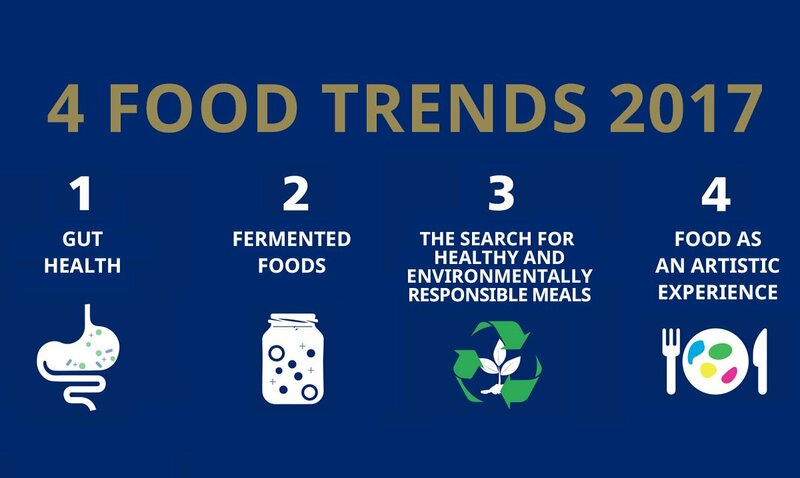 Paris, 27 february 2017 – Le Cordon Bleu, the leading Global Network of Culinary Arts and Hospitality Management Institutes, is happy to share a vision of 2017 foodtrends in the world, through the eyes of its alumni. While each of them have studied a Le Cordon Bleu programme graduating from one of the 35 campuses, some studying the culinary arts to learn the techniques to transform fresh and simple ingredients into the most wonderful tasting dishes, others the different aspects of taste in Gastronomy, or restaurant, tourism and hospitality management, each of their testimonial reflects on consumer interest and expectations. Recent research has revealed that gut health is critical to the overall health of the body. Hence helping the gut flora to develop autoimmunity will become a trend that comes directly through nutrition habits, revolutionizing slowly but surely the way people apprehend foods. “As we are going to hear a lot about the microbiome and eating for your gut's health, I expect to see cookbooks on the topic. In supermarkets, we’ll also see tonics, drinks and more prepared foods that utilizes sauerkraut, kimchi and kombucha.” Kathleen Flinn (USA), writer and journalist. “There is a lot of talk about gut-friendly cooking as it is thought to promote healthy bacteria in the intestine to help with irritable bowel syndrome, bloating, immunity, low energy and libido.” Luiz Hara (UK), chef, food & travel writer, founder of the London Foodie. The interest on fermented foods will continue after the 2016’s craze, and it is directly linked to the new understanding of gut health importance in a balanced life. In this regard, fermentable fibers such as sweet potato, yam and yucca, or else kefir, yogurt, sauerkraut and kimchi will have an increased interest from consumers. Fermented foods is another item we see growing, not only it is trendy but it allows every chef to impart their unique flavor to the ingredients used in their preparations. This is an area we see huge potential in. Jose Luis Cabañero, (Spain). Founder of Eatable Adventures. Each ingredient in the kitchen is scrutinized in order to offer the best combination on a plate – with attention to its nutritional value and the way it was produced. Creativity in the kitchen has a lot to do with it this new way of cooking as chef’s and foodies use their imagination to play with different tastes, colours and textures to make the most of one’s meal. For example, many vegetables of all sorts are making a comeback. “People are re-connecting with food and want to understand how their food is made and where it's coming from. As a result, people want to learn more about nourishing their own bodies and the impact of consuming processed and refined foods.” Adria Wu (UK), Resident chef at Mint Velvet, guest chef on Channel 4’s Sunday Brunch, entrepreneurship mentor for underprivileged women and founder of Maple&Fitz. "In the US, we are ever paying increased attention to the footprint of the foods we eat, striving to eat as locally and seasonably as possible." Susi Seguret (USA), private chef, culinary school director, photographer and wine reviewer. “Nutrition is a major trend. If we take chocolate for example, Chocolate makers from bean to bar to large scale producers are now selling high cocoa content bars with health benefits, so chocolate itself as an ingredient is becoming more important.” Kenta Nakano (Japan), Pastry Chef & Product Development Chief at Dalloyau. What people eat has popularly gained interest. No wonder the #food is one of the most popular on social media. As a result, the visual presentation and detail of one’s meal or snack has never been more important. “Whether that’s pretty handmade doughnuts or unusual popcorn flavours, it’s all about creating an experience that is unique, tastes great and has lots of visual appeal. Social media plays a huge role here as everything has to look fantastic to be shared in this way but it also must taste really delicious.” Peggy Porschen (UK), founder of Peggy Porschen Cakes. I think that artisan butchers will be increasingly mainstream as more people eat less meat, but want better cuts. For me, it is all about ‘the art of coffee and cake’. The Peggy Porschen Parlour does this incredibly well and I see it as a real trend.